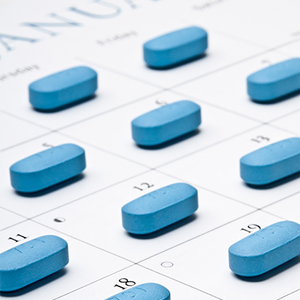 For people who take PrEp, HIV risk can be reduced by up to >90%. Peter L. Anderson et al., Sci Transl Med 12 September 2012. Pre-Exposure Prophylaxis (PrEP) is a prescription medicine which helps prevent people from getting infected with HIV. PrEP is a single pill taken once a day that contains the prescription medicines emtricitabine and tenofovir disoproxil fumarate. Anyone can become infected with HIV. You must be negative for HIV to start PrEP. People who may be at higher risk for HIV infection should consider PrEP. HOW should PrEP be used? What are most common SIDE EFFECTS for people using PrEP? Stomach upset (nausea) can occur and typically goes away after a couple weeks. The medication can cause kidney problems, so we monitor kidney function closely. Other potential side effects include the weakening or softening of bones and liver problems. The medication’s effectiveness, or efficacy, depends on how well a person takes the pill each day, which is called medication adherence. For people who take their pills every day, PrEP can significantly reduce their risk of getting HIV. People who take their pills less regularly have less protection against HIV. The Miriam Hospital STD Clinic is offering PrEP by appointment. Please email Dr. Philip A. Chan if you would like an appointment, pchan@lifespan.org. For more information on PrEP, please visit The Miriam Hospital STD Clinic. The Clinic has walk-in hours on Wednesday, Thursday, and Friday from 12:30-3:30pm.